Just Jussi: How many more sleeps? 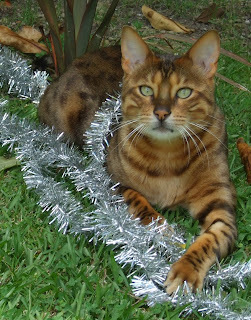 Frasier is getting into the Christmas spirit, we decorated the Christmas tree with trepidation - he tangled himself in tinsel and ran straight across the lawn and up a kauri tree - he was having so much fun that I decided to throw in some baubles and call it a Christmas photo! 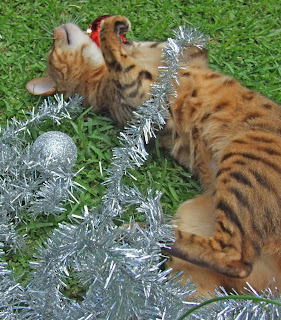 then I was in the kitchen last night and heard a "tinkle tinkle tinkle" went into the lounge and there he is gently patting one of the bells on the tree - nice to see him being gentle for a change! But I am aware that next year with a cat and a baby - the tree may have to have some protection. I have sheltered a long list of cats over the years but never have I seen a cat like yours ---- so very Tiger-like. A beauty. He is beautiful, and very lucky to have you! Happy Holidays.